This outings program is part one of a report on a trip to record nature sounds. You've got to be totally quiet; stand like a statue. And then, if you're in the right place at the right time, you'll capture your sound. Dan Dugan, technical advisor to the Nature Sounds Society. Gina Farr, a multimedia producer from Marin Country, California. Hundreds of birds, amphibians, and a few domesticated mammals. Chris Bell, a museum curator from Sydney, Australia. 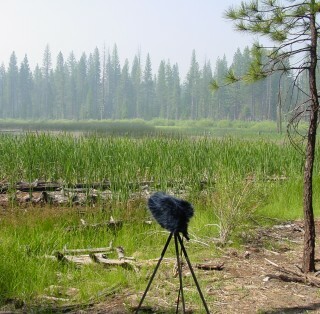 Martyn Stewart, a professional nature sounds recordist for the BBC. Next week, in part two, we'll hear more nature sounds, and find out why it's important to our guests to record and preserve them. You can get tips from Dan Dugan on recording nature sounds by listening to our edition number 90, Listening to Parks.